Want to introduce tablets in your school? Want more tips about how to get the most out of teaching with tablets in your classroom? Want to learn how to track, control and reduce your print costs? We were delighted to be invited by the Royal Air Force Benevolent Fund to enter a team to compete in the Battle of Britain Golf Classic. Taking place on Thursday 11th September at the Old Thorns Golf & Country Estate to raise money for an inspiring cause. The 9th Annual Systems Technology Softball Competition took place last weekend (20/09/2014) with the Sales and Service Departments pitted head-to-head with their pride as the prize. Device Manager NX is a powerful new tool from Ricoh, which puts control of an entire device fleet in the hands of the customer. Device Manager NX empowers an IT Administrator to easily and efficiently manage their entire fleet of networked devices from one central computer. 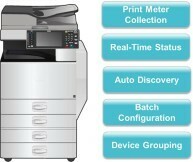 From one intuitive dashboard on their computer screen they can Auto Discover their networked devices, Ricoh as well as 3rd party, and perform batch configurations to specific device groups or even the entire fleet. Is Fuji Xerox’s robotic printer necessary? From cartoons like The Jetsons, to block-buster movies like I-Robot, the idea of having robots to help with everyday tasks has always captivated our imaginations.